Professor of Electrical and Computer Engineering, a Professor of Computer Science, and Director of the Center for Wireless Information Network Studies (CWINS), Worcester Polytechnic Institute, Worcester, Massachusetts, Ph.D. - Worcester Polytechnic Institute. Kaveh Pahlavan (born in Tehran, Iran), is a Professor of Electrical and Computer Engineering, a Professor of Computer Science, and Director of the Center for Wireless Information Network Studies (CWINS), Worcester Polytechnic Institute, Worcester, Massachusetts. 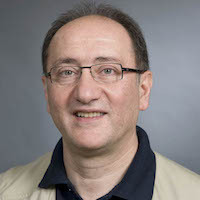 Professor Pahlavan is internationally renown as one of the pioneering visionary researchers of Wi-Fi Technology and wireless Indoor-Geolocation. Since 2009 he has extended his research in wireless access and localization in to the body area networking. He has contributed to numerous seminal technical and visionary publications and patents in voice-band modem, wireless LANs, wireless heterogeneous networks, wireless indoor Geolocation, Wi-Fi Positioning Systems and localization for capsule endoscopy applications. He is author of several pioneering books in the area of wireless networks. He received his BS/MS degree from the University of Tehran in 1975 and his PhD degree from the Worcester Polytechnic Institute, Worcester, Massachusetts in 1979. He began his career as an assistant Professor at the Northeastern University, Boston, MA. Before joining WPI, he was the director of advanced development at the Infinite Inc., Andover, Mass. At WPI he founded the first academic research program in indoor wireless local area networks (WLAN) in 1985 and the first academic research program in indoor geolocation in 1996. He has been a visiting Professor at the University of Oulu, Finland (1995-2007), where he also spent his sabbatical leave in 1999. He has spent his other sabbatical leaves at the Olin College (2004) and Harvard University (2011). He was the Chief technical adviser of the WINDATA, Northborough, MA (1987-1993) and the Skyhook Wireless, Boston, MA (2004-2014). WINDATA was one of the pioneers in design of WLAN and Skyhook is the pioneer of Wi-Fi localization whose technology was adopted for the original iPhone in 2007. Throughout several decades of research and scholarship, he has also served as a consultant to many key players in the wireless industry such as Nokia, Apple, DEC, Honeywell, Electrobit, JPL and NTT. He is the founding Editor-in-Chief of the International Journal of Wireless Information Networks, a member of the advisory board of the IEEE Wireless Communications Magazine and he has played leading roles in numerous high impact conferences. For his contributions to the wireless networks he was the Westin Hadden Professor of Electrical and Computer Engineering at WPI (1993-1996), was elected as a fellow of the IEEE (1996), was selected as a member of the Evolution of Untethered Communications Committee, National Research Council (1997), was the first non-Finn to be awarded a Nokia fellowship (1999), was the first Fulbright-Nokia scholar (2000), and awarded WPI's Board of Trustees' Outstanding Research and Creative Scholarship Award (2011). Principles of Wireless Access and Localization, K. Pahlavan and P Krishnamurthy, JohnWiley and Sons, ISBN 9780470697085, 720 pages, November 2013. Networking Fundamentals – Personal, Local and Wide Area Communications, K. Pahlavan and P. Krishnamurthy, John Wiley and Sons, ISBN 0-470-99289-1, Hardcover, 638 pages, March 2009. Wireless Information Networks - 2nd Edition, K. Pahlavan and Allen H. Levesque,Wiley - Interscience, ISBN 0-471-72542-0, Hardcover, 722 pages, September 2005. Principles of Wireless Networks - A Unified Approach, K. Pahlavan and P. Krishnamurthy, Prentice Hall, ISBN 0-13-093003-2, Hardcover, 584 pages, January 2002. Wireless Information Networks, K. Pahlavan and A. Levesque, John Wiley and Sons, Hardcover, 572 pages, ISBN 0-471-10607-0, April 1995. Co-founder of the IEEE International Symposium on Spread Spectrum Techniques and Applications (ISSTA), 1990. Founder and Editor-in-Chief of the International Journal of Wireless Information Networks, 1994–present. Founder and General Chair, the Invitational Workshop on Opportunistic RF Localization for Next Generation Wireless Devices, June 16–17, 2008 (Worcester, MA),June 13–14, 2010 (Worcester, MA) and May 7, 2012 (New Orleans, LA).